Palestinian militants in Gaza violated the laws of war by firing rockets into Israel during last month's conflict, Human Rights Watch (HRW) says. The New York-based watchdog also said Palestinian civilians were repeatedly put in harm's way when rockets were fired from densely populated areas. Last week, HRW said Israeli attacks on media facilities and journalists in Gaza also violated the laws of war. The eight-day conflict followed an escalation in cross-boundary violence. At least 170 Palestinians and six Israelis were killed in the fighting. Most of the Palestinian fatalities were civilians, although Israel says 30 senior militants were among the dead. 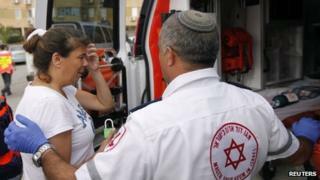 Four of the Israelis killed by rocket strikes were civilians, and two were soldiers. About 1,500 rockets were fired at Israel during the conflict, the HRW report said, quoting figures from the Israeli Defense Forces (IDF). It said at least 800 hit, including 60 in populated areas. "Palestinian armed groups made clear in their statements that harming civilians was their aim," said HRW's Middle East director, Sarah Leah Whitson. "There is simply no legal justification for launching rockets at populated areas." The report also said an unspecified number of rockets fired at Israel fell short and landed in Gaza, killing at least two Palestinians and wounding others. Citing witnesses it interviewed in Gaza, HRW said Palestinian militants "repeatedly fired rockets from densely populated areas, near homes, businesses, and a hotel, unnecessarily placing civilians in the vicinity at grave risk from Israeli counter-fire". The watchdog said Hamas, as the ruling authority in Gaza, should "stop unlawful attacks and punish those responsible". "The laws of war prohibit reprisal attacks against civilians, regardless of unlawful attacks by the other side," it said. "Statements by armed groups that they deliberately targeted an Israeli city or Israeli civilians are demonstrating their intent to commit war crimes." A Hamas spokesman dismissed the report as one-sided. "This report is biased because it equates a nuclear-armed country using all means of aggression against civilians and a people subject to the occupation who are defending themselves against Israeli violations of international accords amid the silence of the international community," Sami Abu Zuhri told Reuters news agency. Israel's declared aim in launching its offensive on 14 November was to stop rocket attacks from Gaza. Thousands of rockets have been fired into Israel since 2005 when it pulled Jewish settlers and troops out of the territory. Israel has carried out hundreds of air strikes against targets in Gaza and launched a three-week offensive against militants there at the end of 2008. The latest HRW release follows an earlier report which accused Israel of violating the laws of war by targeting media facilities and journalists in Gaza during last month's offensive. Two Palestinian cameramen and a two-year-old boy were killed during four such attacks. Israel said the strikes, on a Palestinian media building and one housing Western media, targeted communication equipment on the roofs which were used by Hamas for military operations. It said the two journalists killed were "Hamas operatives". However, HRW said it had not found any evidence that the buildings or individuals constituted "valid military objectives".